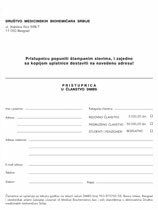 Prof. dr Nada Majkić-Singh s.r. 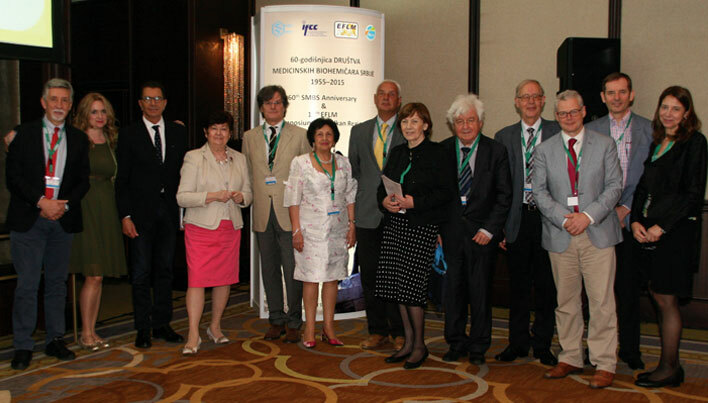 For the 11th time, the Society of Medical Biochemists of Serbia (SMBS) was the host of the EFLM Symposium for Balkan Region on May 14 and 15. 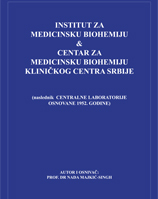 This year’s Symposium, entitled "Laboratory Medicine Specialist Focuses on the Patients Wellbeing", was organized by SMBS, EFLM and Department of Medical Biochemistry of the University of Belgrade – Faculty of Pharmacy, and under the auspices of IFCC, Balkan Clinical Laboratory Federation (BCLF), Ministry of Education, Science and Technological Development and Ministry of Health of Republic of Serbia. 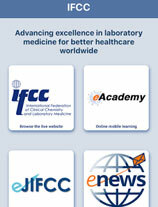 During the two day Symposium, the participants had a chance to hear about the current hot topics concerning the laboratory medicine profession today from the leading European experts in this field – Prof. Mauro Panteghini, Prof. Simone Zerah, Dr Gilbert Wieringa, Dr Ian D. Watson, Dr Wytze Oosterhuis, Prof. Elizabeta Topić, Dr Wim Huisman, and Prof. Ana-Maria Šimundić; as well as about the situation in training of specialists in laboratory medicine, accreditation and key processes quality indicators in Serbian medical laboratories from Prof. Nada Majkić-Singh and Dr Zorica Šumarac. 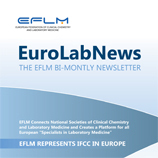 The talks were about the role of laboratory medicine specialists in verification of in vitro medical diagnostics metrological traceability, implementation and the transposition of the Directive on the professional qualifications, common training frameworks for specialists in laboratory medicine, common values in the liberal professions in Europe, laboratory medicine in the EU, the implementation of continuous professional development, present situation on accreditation in Europe, and preanalytical phase quality management. This year’s round table discussion, which finalized the Symposium, was exceptionally vibrant. It was hosted by students of medical biochemistry from the Faculty of Pharmacy, University of Belgrade, gathered in the "Team of Medical Biochemists". After the short presentation they had made on their extracurricular activities, they initiated a discussion with (and among) the distinguished lecturers about the topic of the utmost interest to these enthusiastic young people, and that is, as they defined it, what it takes to become a lab hero. After the completion of the Symposium sessions, the Ceremony of the 60th Anniversary of the SMBS celebration began. The ceremony was opened by the Infinity Quintet and their inspiring performance of popular pieces by Guns’n’Roses, Whitesnake, Scoripions, in classical adaptation for a string quintet, symbolizing the continuity of the Society’s work during the past 60 years and its constant change and advancement according to the demands of the actual time. 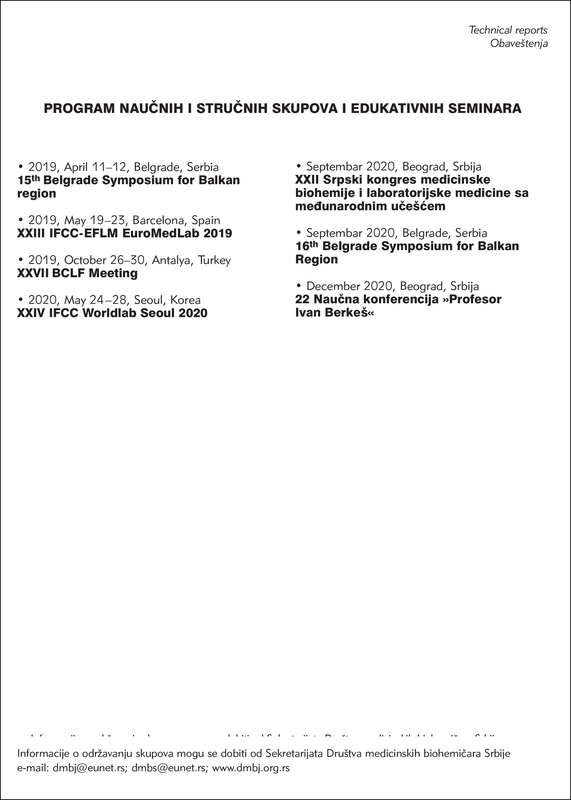 Prof. Nada Majkić-Singh, the Executive Director of the SMBS, reminded us briefly of the beginnings and development of medical biochemistry in Serbia, from the middle ages on, as well as of the foundation of SMBS and its various activities. 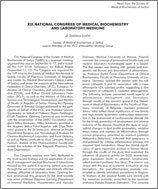 This was followed by photos from numerous events that SMBS patronized and organized during the last 60 years, which were included in the book "Serbian Medical Biochemistry in 21st Century – 70 years later", published on this occasion by the SMBS. Many distinguished guests from Serbia and abroad were invited and responded to the summons, and they made the welcoming address to the gathering. The greatest honor to the SMBS was made with the attendance and addressing of Her Royal Highness Crown Princess Katherine of Serbia. Congratulations to the SMBS were delivered also by the IFCC President Prof. Maurizio Ferrari, EFLM President Prof. Mauro Panteghini, the Dean of the Faculty of Pharmacy University of Belgrade Prof. Zorica Vujić, the Dean of the Faculty of Medicine University of Belgrade Prof. Nebojša Lalić, and the Director of the Chamber of Biochemists of Serbia Dr Slavica Cimbaljević. 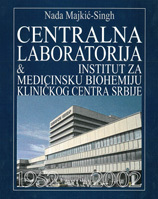 Also, the President of the Croatian Society of Medical Bio chemistry and Laboratory Medicine Ana-Maria Šimundić and Sonja Kuzmanovska, Representative of the Macedonian Society of Medical Biochemistry congratulated the Anniversary, and the letter from the Polish Society of Laboratory Diagnostics sent on this occasion was read. Regarding the 60th Anniversary of the SMBS, the President of the SMBS Dr Zorica Šumarac delivered the awards. 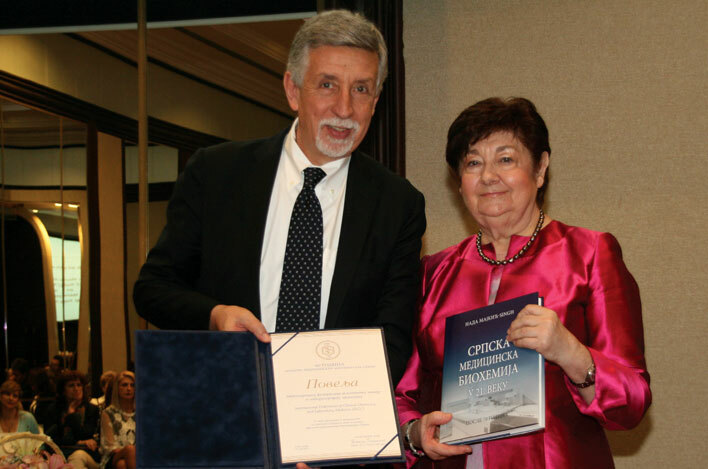 The Honorary Diploma, the highest recognition of the SMBS, intended for the designated individuals for promoting clinical chemistry and laboratory medicine in Europe and globally, was handed to Prof. Simone Zerah. The highest award, the Charter, regarding the 60 years of existence and work, in appreciation and gratitude for the significant contribution to the work and development of the SMBS, was delivered to IFCC and EFLM. As recognition and gratitude for significant contribution to the work of the SMBS, Diplomas and Acknowledgments were handed to 60 individuals and organizations. 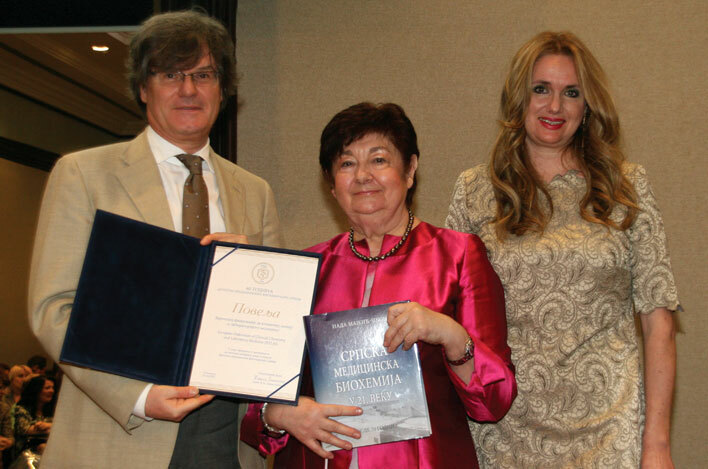 The special Honorary Diploma and Anniversary Logo were delivered to Prof. Nada Majkić-Singh, the longtime President of the SMBS and present Executive Director, for her enormous contribution to the foundation and development of the SMBS and the profession of medical biochemistry in Serbia. The socializing of guests and many members of the SMBS continued long after the official part of the Ceremony. Among many kind wishes the SMBS received for its 60th birthday, one was mostly heard to celebrate at least a hundredth.